What Grammar Checker do I recommend? My favorite grammar checker aims to be your personal online writing coach. Highlighting over 100 different aspects of writing, it covers everything from using the passive voice to writing style. It will improve your writing, teach you grammar and make you feel supported and confident every step of the way. Do you know what resource I am talk about? Gives you confidence because you have a second set of eyes looking at your writing. Helps you learn Grammar with easy to understand examples and explanations. Provides you with the opportunity to examine your writing and make changes when needed. Human judgement is required when using Grammarly though. Highlights your common mistakes so you can focus on them while you write. Makes you feel like you have your own private tutor looking over your shoulder as you write. This grammar checker points out possible mistakes and goes a step further by explaining why it might be incorrect. It explains the grammar, provides an incorrect and correct example and makes me feel like I am working with a grammar tutor (someone highlighting possible mistakes, how the grammar should work and encouraging me to look further). Why Do I Use Grammarly? It feels like I am having a session with a grammar and style coach each time I use it. It helps you improve your current piece of writing, and learn from your mistakes so that you improve your writing skills and make fewer mistakes in the future (no other grammar checker makes me feel this way). Customized Grammar Guide. It takes your most frequent mistakes from all your edited writing and creates a custom grammar guide book just for you! This guide enables you to focus on the grammar that is weakening your writing. Gives people the tools needed to really improve their writing, without paying an editor or tutor by the page or hour. "Grammarly is an automated proofreader and your personal grammar coach." I believe that this is a tool to help eliminate mistakes and draw attention to grammar and structures. It is like riding a bike with training wheels. It helps you focus on the key points before you graduate to a two-wheeler. Look at why something might be wrong and how you might fix it, you can IGNORE it if you intentionally want to break a grammatical rule. It really makes me feel like I've got a second set of eyes looking at the mechanics of my work. I’m an ESL teacher but I am far from perfect. Writing hundreds of articles invites typos and mistakes. I look at my writing myself but you get so close to your work that you become blind to your mistakes. HEY! Look at this. Is this ok? It makes the process more like a tutoring session and seems educational. The grammar explanations are very clear and after using this over and over again I am improving my grammar knowledge AND application by earning from previous mistakes. I love how quick and easy it is to paste a letter or article into the tool and then to test it. I think the key is that I KNOW Grammarly will make a few mistakes and will not be correct 100% of the time. Grammarly could create a false sense of confidence or security. You can not write a letter and then use grammarly to magically make it perfect. This tool does not eliminate the need to carefully proofread your own writing, read it aloud and review it before turning to grammarly. Think of it as a “final review”. Grammarly sometimes highlights something that is actually correct. In that situation, I just ignored the comment and carried on proofreading my text. Grammarly forces you to think about your writing. It seems like a training program for your mind. It allows you to open your mind and think about your writing from new angles and perspectives. Grammarly makes me more conscious. It is more than merely a “grammar checker”. It trains you to think about your most common mistakes and avoid making them in the first place. The MS Word add-on does not seem to work on my version of Word. I am sure that it would be great to use inside Microsoft Word! Suggestion to make it better: I wish I could press the right arrow button to go to the next issue. Clicking the next button with my mouse is annoying because, depending on the size of the grammar explanation, the next button moves around the screen. Grammarly reminds me of block builder for SBI (the program I use to build this site). It trains you how to have the right components on your page and blend in the require keywords into each section. Header, text, images, links. After using each system over and over you start to automatically add the keywords and elements without thinking. It is the perfect way to train yourself to build a relevant website page. Grammarly does this but in terms of grammar and writing. The price is not provided until after you sign up for a free trial (slightly annoying) but I spoke with a Grammarly representative and they told me the price. If you have been shopping for a grammar checker, I hope that this review can help you decide if Grammarly is right for you. I highly recommend it to anyone looking to improve their writing and reduce the number of mistakes they make in their emails, letters, essays and business documents. 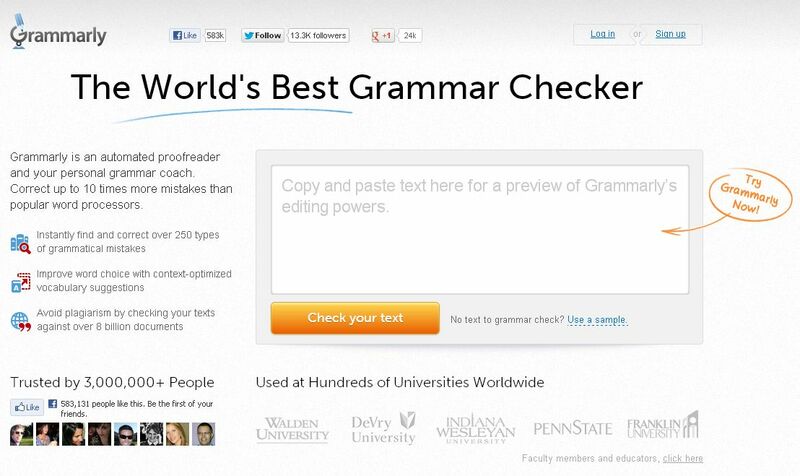 Grammarly is not the only grammar checker available, but it is the best I have used so far. If you'd like more information just visit grammarly.com here.